End of Bay Road (1/4 mile)--make sure to catch a sunset! Come to Mermaid Lane – a beautiful house in an amazing location! This is a large fully renovated (winter of 2013) house with all the amenities, yet still feels like a cottage on the Cape. 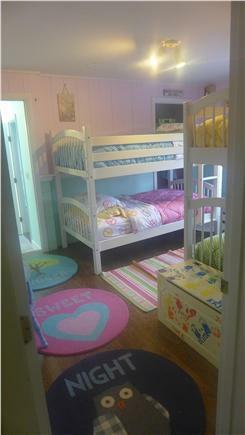 Five bedrooms (one king, two queen, kids’ room with 2 sets of bunks, plus a bonus room with two twin beds), all with brand new, high-end mattresses and brand new pillows and blankets. There are two living room areas, an eat in-kitchen plus dining room, screened porch, dedicated office space, wifi, expanded cable, and a fully equipped kitchen. The house has carefully selected furnishings, comfortable yet lovely/ artsy, a huge wrap around deck with plenty of great outdoor furniture for relaxing, plus a complete outdoor teak dining room set for al fresco meals. 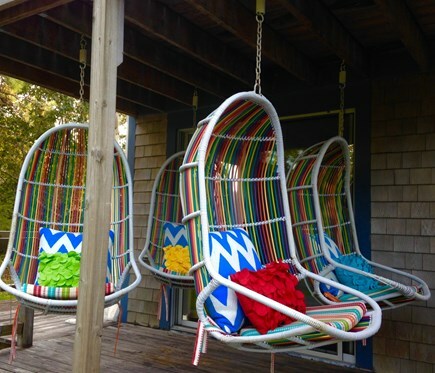 There is a fire pit surrounded by Adirondack chairs for campfire fun while gazing at the amazing Eastham sky, a huge flat yard that can accommodate family sports, where there is always something in bloom. With 3 full baths (plus an outdoor shower! ), there is plenty of room for extended family--or up to three families of 4--to vacation in comfort together while still having separate space. New this summer: a moonlight garden. 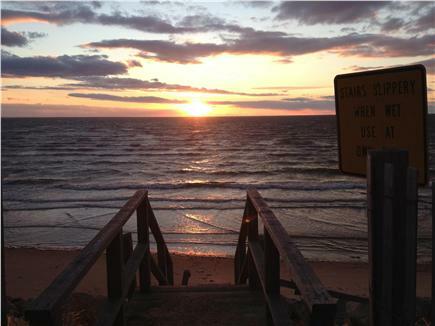 Located on quiet a dirt road in the very desirable Bay Road neighborhood, just 3 tenths of a mile to one of Eastham’s most popular bayside beaches, Campground Beach, which features spectacular sunsets over the Bay on a nightly basis. Just a few miles to the Cape Cod National Seashore, with 17 miles of uninterrupted, quintessential Cape Cod beaches. Not your average rental, a truly unique property with limited availability — you will never want to leave!! Bedroom configuration: On the first floor there are two bedrooms (both queen) and two bathrooms. 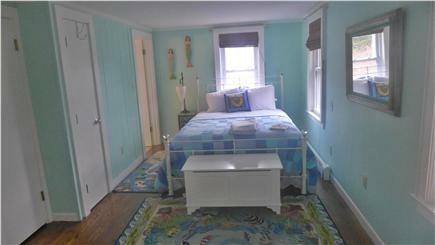 The first bedroom had the green bedspread and is off of the hall. The two bathrooms are farther down the hall, across from one another. The one on the left has a shower only, and the one on the right (with teak ceiling) has a tub. The second queen bedroom is at the end of the hall, and can be used as a suite: it has a doorway directly to one of the bathrooms, and also an attached second living room/kitchenette (see pictures) with direct deck access. Perfect place for a pack and play as it is quiet back there. Upstairs is the master bedroom (king) with private balcony. The room with two sets of twin bunks is connected to the master via the bathroom (shower only). 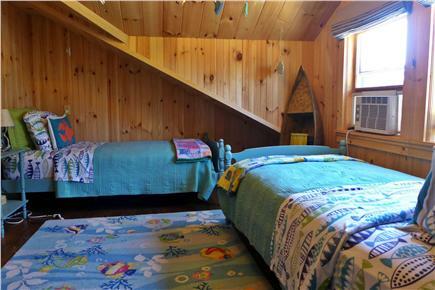 Also on the third floor is the room with two twin beds, which we call the ''fish bowl.'' BRING YOUR OWN LINENS!! Additional pricing info: Small discount available for two or more successive weeks. Please ask!, State and local taxes of 12.45% will apply. We had a lovely time here at Mermaid Lane! 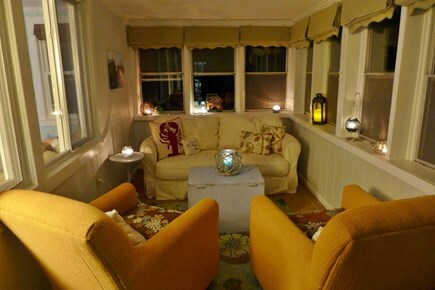 The house was big enough to make everyone comfortable but has lots of cozy areas to gather and spend time together. 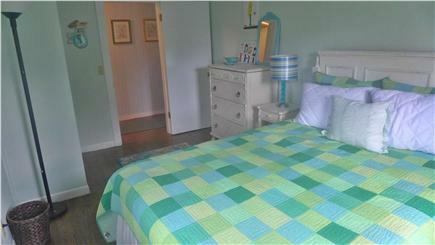 Very short walk to the beach and lots of restaurants and min-golf within a 5 minute drive. One of the kids counted and discovered everyone in the house could be on their own swinging chair at the same time--that's how many fun sitting areas we had to play with. Would definitely rent again! We rented this house with extended family, 12 total, and we couldn't have been more comfortable! 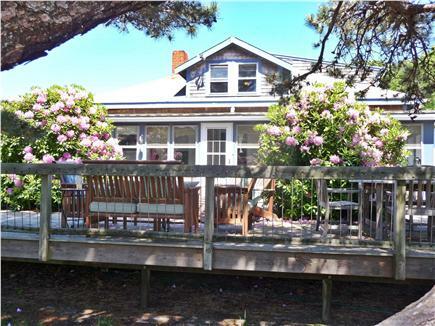 The home sits on a very large, private lot with easy access to a private beach as well as Campground Beach. The property offers so much outdoor space with a sprawling deck where we spent most of our mornings and evenings. 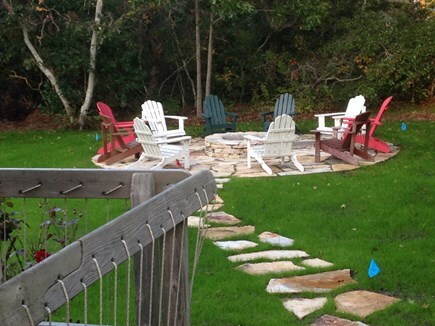 Large yard space for games and an awesome fire pit! We found the bedroom setup to be very comfortable and well laid out for multiple families. 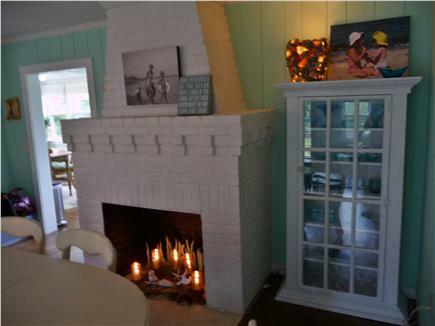 Ginny and Brad's home is exactly as pictured (beautiful, spacious, with adorable furnishings). The home is very comfortable and we especially loved being able to take advantage of some beautiful Cape weather by relaxing out on the porch, lying in the hammock, and having an outdoor shower. We accommodated 9 adults (our wedding party) very comfortably, but this would also be a wonderful property for large families visiting the Cape. There's even a tree swing and rope to climb the backyard tree! The location was great for us. 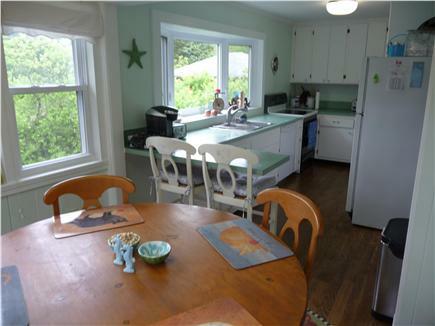 We love Eastham and were a short distance from both the bay and the ocean; biking/driving around was easy, yet the home itself feels very secluded and is situated on a nice large piece of land so you don't feel like the neighbors are too close. 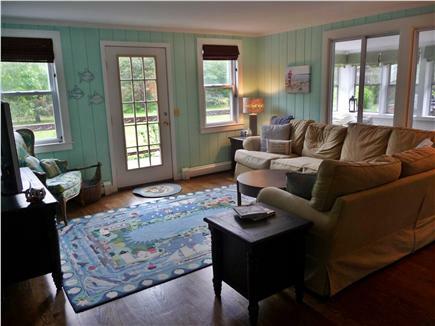 Mermaid Lane is a lovely Cape Cod cottage. The house is so comfortable and homey. So many pretty rooms . A space for everyone. The yard is spacious. Our 5 grandkids had much fun playing hide and seek, playing baseball, and swinging. The fire pit a must!! We had many a family dinner on the great deck. Mornings are the best on the deck...peaceful just watching the many birds that visit. The home is immaculate and has all the comforts of home. Ginny is great to work with! Our family so loved our fun filled, happy, two weeks vacationing at wonderful Mermaid Lane!!! Spacious and well thought out! We were a group of five adults and five kids, ages 3-7, staying here in order to attend a family reunion with 24 other people. I picked this place because it seemed like the living room was scaled to the size of the house and it did not disappoint! The living room and dining area make up a great room. You can move chairs around and gather 9-10 adults on/near the large sectional or easily gather 8 or possibly more around the dining table. (A kitchen table and counter add more eating space.) I had lunch for 34 people one day and we fit comfortably, spreading out in the living room, the deck, and the yard, which had 10 Adirondack chairs. The house has 6 room air-conditioners (3 upstairs and 3 downstairs) and kept the house very comfortable even when it got into the 90s outside. We opened a few doors between some rooms. The kitchen was well equipped and labeled making it easy to use. The house was lovingly decorated with colors that also visually opened the space. 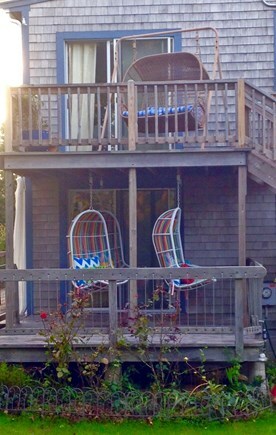 The sunroom kept MOST of the sand, flip flops, and beach toys out of the house. Perfect for two families and small kids! The deck is spacious, the rooms are comfortable, and the yard is HUGE. Only 1/3 of a mile to a wonderful bay beach at low tide. 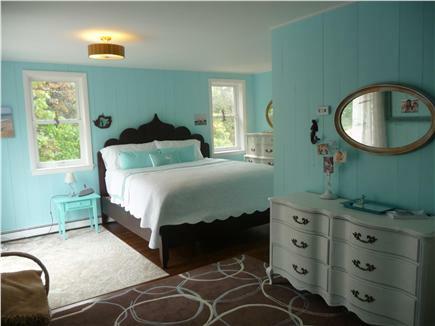 Well maintained and lovingly decorated, this home was perfect for us. There is almost an in-law suite which has a nice bedroom and second room attached with a sink, microwave, and refrigerator. It was perfect to set up as a nursery as it is out of the way and quiet from the rest of the house. Kitchen is very well stocked and the fire pit is a must. Enjoy! We had sunny weather in the 80s all week so we spent a lot of time at Campground Beach that was just a short walk. Being a bayside beach, it was good for the kids to wade, swim, and explore for seashells and creatures for hours. We also rode bikes along the 20+ mile rail trail, rented a boat in Wellfleet and hiked some trails at the nearby Wylie Park (there is also a clean lake and kids playground there). We spent a day in Provincetown and visited the Pilgrim Monument and museum. The kids loved climbing the 252 ft tower (our 3 yr old needed a lift about half-way), seeing the museum and then taking a 75 min kids harbor cruise (where we saw seals, lobsters, crabs and views from an underwater camera). We spent most of our meals grilling on the big deck and roasting marshmallows in the huge fire pit. Our favorite restaurants were Arnold's for seafood and the Red Barn for amazing pizza, ice cream, beer and mini golf. The house was exactly as described. 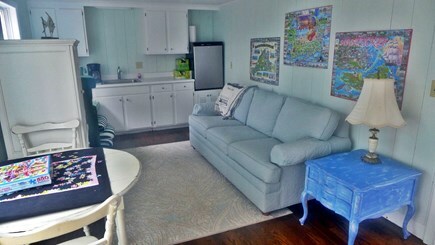 The location was excellent (5 minute walk to Campground Beach), and everything you need is provided in this house. We were a group of 12 including kids, and there was more than enough room both inside and out in the huge yard. I would not hesitate to go back!